To convert the text above to a real email address, remove all the stuff in brackets, remove all spaces, and convert "at" to the "at" symbol (i.e. @), and (dot) to a dot (i.e., a "." ) and put it together to form an email address. 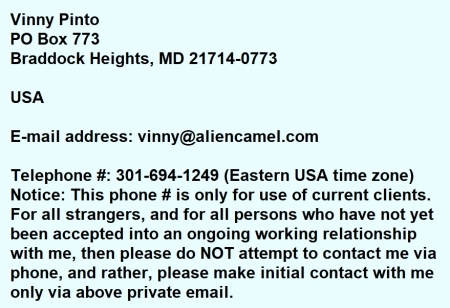 Please note that any calls or emails for any consulting purposes must be prepaid; no consulting services may be prepaid until Vinny has granted permission to do so, that is, until he has agreed to accept you as a consulting client -- for more details, please see the Consulting Terms page on Vinny's main website.